Gender is an often discussed topic, but a neglected perspective of climate change policy. Migration is one adaptation strategy in response to climate change, and since women and men experience migration and climate change differently, a gendered perspective offers important guidance for the formulation of policies addressing both topics. Gender plays a vital role in the development of migration policies and its importance in terms of climate change was even recognised in the 2015 Paris Agreement. Nonetheless, groups like the Women and Gender Constituency, one of nine UNFCCC stakeholder groups, felt that gender and “climate justice” were still under-recognised. In Pacific Island states the impacts of climate change are already visible and local women are potentially more vulnerable than men. The United Nations University Institute for Environment and Human Security (UNU-EHS) conducted participatory sessions with Pacific islanders in Kiribati, Tuvalu and Nauru to supplement its household survey in the Pacific with further details on the perceptions of climate change and migration among women and men. Here, I delve into how this research contributes to, among other objectives, the development of gendered migration policies in the context of Pacific climate change. In the Pacific Climate Change and Migration (PCCM) project, UNU-EHS joined forces with the United Nations Economic and Social Commission for Asia and the Pacific, the United Nations Development Program (UNDP) and the International Labour Organization, as well as the University of the South Pacific. The PCCM project shows that in the past decade, most households in the small island developing states (SIDS) Kiribati, Tuvalu and Nauru experienced impacts of climate change like incremental sea level rise, saltwater intrusion and drought. UNU-EHS organised participatory “Livelihood Risk Ranking Sessions” to gather in-depth information on key risks and problems as well as potential solutions. In a 2013 study on the linkages between gender and climate change in the Pacific, UNDP found that the “degree to which people are affected by climate change impacts is partly a function of their […] gender”. The underlying reason, provided by, among others, the Women’s Environment & Development Organization and the United Nations Population Fund, is that women are seen to be more vulnerable compared to men. This applies particularly to women living in coastal communities like the Pacific Island states, where agricultural land is scarce and natural resources like fresh water are limited. Mirjana Morokvasic discussed how migration “can be part of a household’s strategy for survival”, spotlighting that migration is one way to create more resilient households. The Intergovernmental Panel on Climate Change stresses “it is clear that there is the potential for human movement as a response to climate change”. In these contexts, the PCCM project emphasises how labour migration can be a way to diversify household income. At a labour migration workshop organised by the PCCM project in Suva, Fiji, Head of the European Union Delegation for the Pacific, Ambassador Andrew Jacobs, remarked on the difficulty to offer sufficient work opportunities for women and men on their respective islands — “challenges that may become even more complex with the increasing adverse impacts of climate change”. Therefore, migration offers an adaptation measure that can provide other sources of income under changing environmental conditions. Pacific islanders use adaptation strategies to reduce their vulnerability to the impacts of climate change. In the UNU-EHS “Livelihood Risk Ranking Sessions” women suggested moving inland as a reaction to floods and coastal erosion or high tides, whereas men proposed building sea walls. And while both sexes emphasised a need for improvements in water management and called for governmental assistance, women suggested moving to places with less saltwater intrusion. Differences between women’s and men’s responses were visible. Participating women mentioned migration with a positive connotation while men focused on other measures and potential challenges arising from migration such as overcrowded homes due to immigration to key internal destinations, and resulting security implications which were important to them. It is important to analyse the differences between female and male migrants. Focusing only on migrant men leaves half of a society’s human resources unused or underused, thereby limiting the possibilities for economic and social progress. Gender inequality also limits households’ abilities to build sufficient resilience to the impacts of climate change. In 2008, Hon. Amberoti Nikora, Kiribati’s Minister for Internal and Social Affairs, acknowledged that there has been a lack of attention to the gender and climate change nexus and stressed “the importance of the inclusion of gender in developing mitigation activities” as well as in adaptation measures. The latter point is further supported by Ruth Lane and Rebecca McNaught in their study “Building Gendered Approaches to Adaptation in the Pacific“. However, increased awareness of gender equality and women’s empowerment has not yet translated into sufficient labour migration options for women. This is especially true for employment overseas because, at present, men dominate temporary migration like seasonal worker programmes. In this regard, the International Organization for Migration (IOM) calls for further research on the understudied connection between migration, gender and the environment. A starting point for gender research on the topic is the Institute of Development Studies’ 2005 BRIDGE report on gender and migration, followed in 2011 by the BRIDGE report on gender and climate change. One point of ongoing discussion considers social and cultural factors present in some SIDS. Bandita Sijapati, for example, suggests in her 2015 IOM article “Women’s Labour Migration from Asia and the Pacific: Opportunities and Challenges” that patriarchal cultures can be an obstacle to female out-migration. While these concerns exist, Patricia R. Pessar and Sarah J. Mahler argued in the 2013 article “Transnational Migration: Bringing Gender in” that women who are able to migrate, might then actually be able to gain more from migration in terms of empowerment compared to men. The 2015 Paris Agreement shapes, as a central international document, future climate change policies and is especially relevant for SIDS in the Pacific, as outlined by the IPCC in 2014. Gender is included in the perambulatory and operative part of the 2015 Paris Agreement that was adopted at the 21st Conference of the Parties (COP21) to the United Nations Framework Convention on Climate Change (UNFCCC). The inclusion of gender in the Paris Agreement’s operative paragraphs signals progress from prior agreements. Paragraph 5 of Article 7 in the Paris Agreement “acknowledge[s] that adaptation action should follow a […] gender-responsive […] approach” and paragraph 2 of Article 11 mentions that “capacity-building should be [… a] process that is […] gender-responsive”. Regarding (female) migration, the Paris Agreement acknowledges the rights of migrants in the context of climate change action and sets out plans for a task force on climate change displacement. Thus, references to gender and women’s empowerment appear in the text but are still to be integrated in all areas of the agreement. 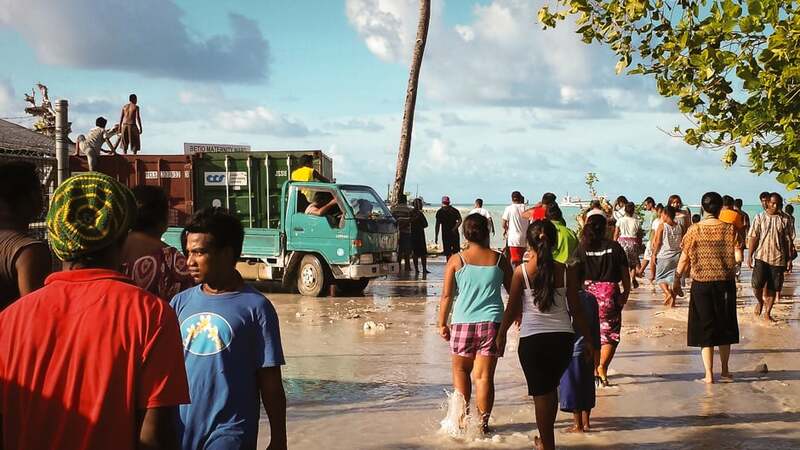 While the 2015 Paris Agreement sets out a global framework to combat climate change, at a local level in the Pacific the development of migration policies in the context of climate change is currently ongoing. The analysis of gendered migration patterns in the context of climate change offers the possibility to account for differences in drafting of migration policies. Thereby, positive impacts are spread in the origin country among migrants, their families and friends, as well as in the destination country’s society. According to Nana Oishi, states and policies play an important role in influencing female migration by facilitating or hindering the emigration and immigration of women compared to men. Asian countries like the Philippines, Sri Lanka and Indonesia have adopted a liberal approach with “active state policies that provide information, assistance and networking opportunities to actual and potential migrants”, Jayati Ghosh writes for the United Nations Development Programme. In the Pacific a lack of comprehensive scientific data has until now limited the possibilities to develop a migration policy for Kiribati, Tuvalu and Nauru. The inclusion of research data in important policies is a step forward, and more research, such as detailed UNU-EHS reports, can contribute towards formulating future gendered migration policies. The original version of this article appeared on the blog of the UNU Institute for Environment and Human Security. Ann-Kristin Matthe works in international development cooperation with GIZ (Deutsche Gesellschaft für Internationale Zusammenarbeit). She previously was an intern with the Environmental Migration, Social Vulnerability and Adaptation section at the United Nations University Institute for Environment and Human Security.